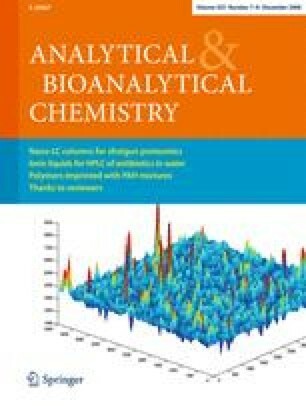 The synthesis and evaluation of a molecularly imprinted polymer (MIP) as a selective matrix solid-phase dispersion (MSPD) sorbent, coupled with high-performance liquid chromatography for the efficient determination of chloramphenicol (CAP) in fish tissues are studied. The polymer was prepared using CAP as the template molecule, vinylpyridine as the functional monomer and ethylene glycol dimethacrylate as the cross-linking monomer, and sodium dodecyl sulfate as the surfactant in the presence of water as a solvent by miniemulsion polymerization. The CAP-imprinted polymers and nonimprinted polymers (NIPs) were characterized by Fourier transform IR spectroscopy, scanning electron microscopy, and static adsorption experiments. The CAP-imprinted material prepared showed high adsorption capacity, significant selectivity, and good site accessibility. The maximum static adsorption capacity of the CAP-imprinted and the NIP material for CAP was 78.4 and 59.9 mg g-1, respectively. The relative selectivity factors of this CAP-imprinted material were larger than 1.9. Several parameters influencing the MSPD process were optimized. Finally, the CAP-imprinted polymers were used as the sorbent in MSPD to determine CAP in three kinds of fishes and resulted in satisfactory recovery in the range 89.8–101.43%. CAP-imprinted polymer as a sorbent in MSPD is better than C18 and attapulgite in terms of both recovery and percent relative standard deviation. The baseline noise was measured from a chromatogram of a blank fish sample which was treated after the MSPD procedure using CAP-imprinted polymer as a sorbent. Signal values of 3 times the noise (signal-to-noise ratio of 3) and 10 times the noise (signal-to-noise ratio of 10) were used to calculate the limit of detection and the limit of quantitation of the calibration curve. The limit of detection for CAP was 1.2 ng g-1 and the limit of quantitation was 3.9 ng g-1. This work was supported by the National Natural Science Foundation of China Fund (no. 20775029), the Huo Ying Dong Science Fund of China (no. 104038), the Program for New Century Excellent Talents in University (NCET-07–0400), and the Central Teacher Plan of Lanzhou University.